Large size: 28" long x 10" diameter; 6 lbs. The Supportive Round Cotton Yoga Bolster from Yoga Accessories is filled with 100% cotton batting. Lightweight yet dense and firm, with a handle on each end, this is a great prop for restorative poses and prenatal yoga. Our cylindrical bolsters have a zippered removable pillow case that is machine washable. Please note that our bolsters are filled with natural cotton, not synthetic foam like competitors, which means that the actual measurements of the bolster are slightly bigger initially (a little over 10" diameter near the center). The cotton will settle over time. Our generic round yoga bolster comes in 11 color choices, including two options with a gorgeous embroidered lotus design with Om symbol on each end, at no additional cost to you. 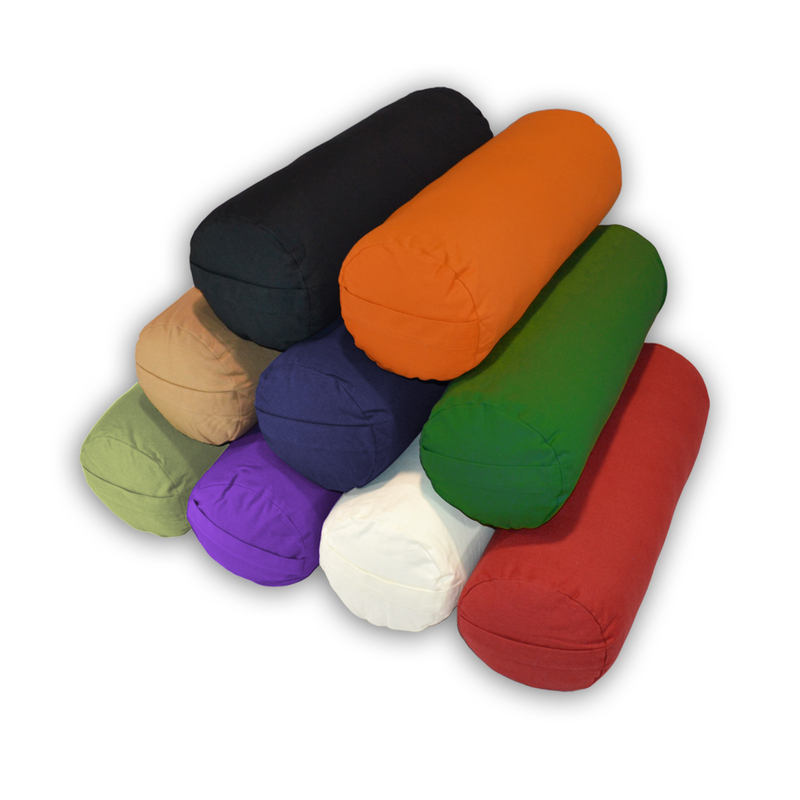 These yoga pillows are well made and long lasting, but if you are using this bolster in a yoga studio or can't decide on just one color, we also sell separate round bolster cotton cases, so you won't need to replace the entire yoga bolster. Cover: Machine wash cold, gentle cycle, mild detergent. Line dry. Core: Spot clean only with mild detergent. All measurements are seam to seam. Good quality at a reasonable price. Discount pricing on larger quantities is definitely appreciated. Perfect bolster at a great priced. Everything just as advertised. I highly recommend this bolster. Perfect, not too heavy but sturdy fabric. These bolsters are great. The outer cover is durable and can be removed and washed. The bolsters come quite full of cotton, but it's easy to remove some cotton from the inner lining for a softer bolster (I save the cotton so I can add some back later as the bolster compresses with use). I've used these bolsters for years and recommend them to my friends and students. Highly recommend! I just purchased red and orange bolsters for my yoga studio. The students are delighted with the colorful effect. These bolsters are firm but much lighter than the previous bolsters from, say 8-10 years ago. The new, lighter bolsters are easier for the students to lift and move around. Bought 20 for a new fitness location and they arrived very quickly. The item seems to be fantastic quality and the purple color is very vibrant and a great choice. Very satisfied with this purchase. The bolster is excellent for restorative yoga. This is a very nice bolster, at a very fair price. I can imagine buying additional bolsters - we have 4, two each of two colors, in two parts of our home, or maybe additional covers to ensure they last a long time.